So much has been going on lately in my life and yet nothing at all... it's like the calm before the storm. We were flirting with the possibility of selling our house... then we decided not to, Brandon is back in school, and I've been contemplating "what to be when I grow up". But today I am going to focus on the changes we've made to our diet and well being. After I got back from my trip to Miami I did a little soul searching with my love affair with food. I know from past experience, science, and just my intuition, that I need to stick to a low carb or at least a low glycemic index diet. Have you ever had a theme floating in your head and somehow the universe keeps pointing you in that direction. It's like I thought I need to re-assess our diet, as I started reading Dr. Mercola's book on the airplane ride back. Not two weeks before, Brandon and I switched to all organic toiletries- but that is another post in itself... the short version is that we discovered this cosmetics database that rates products on a scale from 0-10 on it's toxicity rate and then lists the hazards its linked to. So after I researched all the toiletries, besides being appalled, we decided to switch to organic.The day after I got back from my trip to Miami, we watched the documentary Food Inc. A must watch. So sobering... glad we saw that before doing the groceries... all of these things combined led me to really question the thing we were putting in and on our bodies. We upped our grocery budget by lowering our eating out budget and decided to buy more organic meats and dairy, and to remove all gluten from our diet. Sugar became a big no-no as we cut out all refined carbs and sugar is a big one. We also decided to add more veggies, something I've been doing for some time now. I wanted to drastically reduce the pre-packaged pre-made stuff I bought too... the ideas was to eat foods in their whole state before being processed. 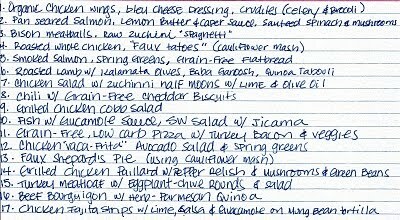 Lastly, I started planning out our grocery shopping by the meals I'd planned for the next two weeks- See the index card below. It's tedious, but it works. Now this all sounds fine and dandy, but about 3 days into this new lifestyle we got a sugar craving. I started searching and searching for something that would constitute dessert yet, not break our new-found commitment to grain, sugar and gluten free diet. I discovered this AWESOME blog with loads of recipes that fit our new lifestyle. I will admit though, there were a ton of ingredients that I had never heard of, such as coconut flour and a natural sugar substitute called Z Sweet that is a nearly perfect substitute to sugar. So long story short I perused this blog, found a cake that seemed interesting and went to whole foods for the ingredients. I slightly modified the recipe by omitting the food coloring, and I separated the egg yolks from the whites, beat the whites to form a meringue and incorporated them into the batter at the end. I think the only thing I will add next time is to melt 6 oz. of dark unsweetened chocolate and add it to the batter. I'd have to add a little more sweetener to compensate for the bitterness of the chocolate, but other than that I'd stick to the recipe.